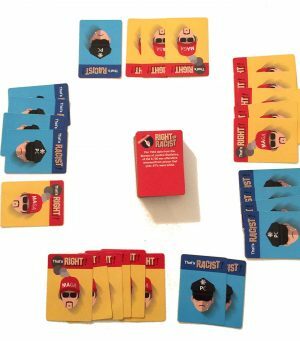 Right Or Racist is the party card game that confirms and combats stereotypes based on data, studies, and general information. This game will spawn great dialogue and laughter, all while informing the public on interesting data. STEREOTYPES: Are they RIGHT? Or Are they RACIST? America is a divided country. One side claims that America has become too racist, sexist and hateful, while the side says people have become too sensitive and politically correct. I created this game to help shed some light on the truth, and try to determine once and for all, what is right and what is racist. I hope that this game becomes a tool for us to learn about one another and ourselves, engage in useful dialogue, and most importantly, to laugh at ourselves. Add a Review for "Right or Racist"